BOISE, Idaho— Three conservation groups initiated a lawsuit today against the Governor of Idaho and other state officials to halt trapping that illegally kills one of the rarest cats in the United States, the Canada lynx. The Center for Biological Diversity, Western Watersheds Project, and Friends of the Clearwater notified Gov. Butch Otter, the director of the Idaho Department of Fish and Game, and members of the state Fish and Game Commission of the Endangered Species Act violations in permitting trapping that leads to incidental killing of lynx. The Canada lynx is a threatened species that numbers as few as 100 animals in the state of Idaho, where the rare animals are under unprecedented threat from recreational trapping. Although the intentional trapping of lynx is not permitted under Idaho law, with increases in trapping licenses and fur prices, especially for bobcat, at least three lynx have been unintentionally trapped by bobcat trappers in just the last two years. Under the Endangered Species Act, trapping of lynx, even if released alive, is illegal. Any agency permitting such trapping is liable under the Endangered Species Act. The Endangered Species Act makes it illegal to kill, trap, harm or harass any endangered or threatened species. A government agency that permits such activity is also liable. The Idaho Department of Fish and Game can develop a conservation plan with measures to avoid and reduce incidental trapping of lynx and receive an incidental take permit. The plan, which would require approval by the U.S. 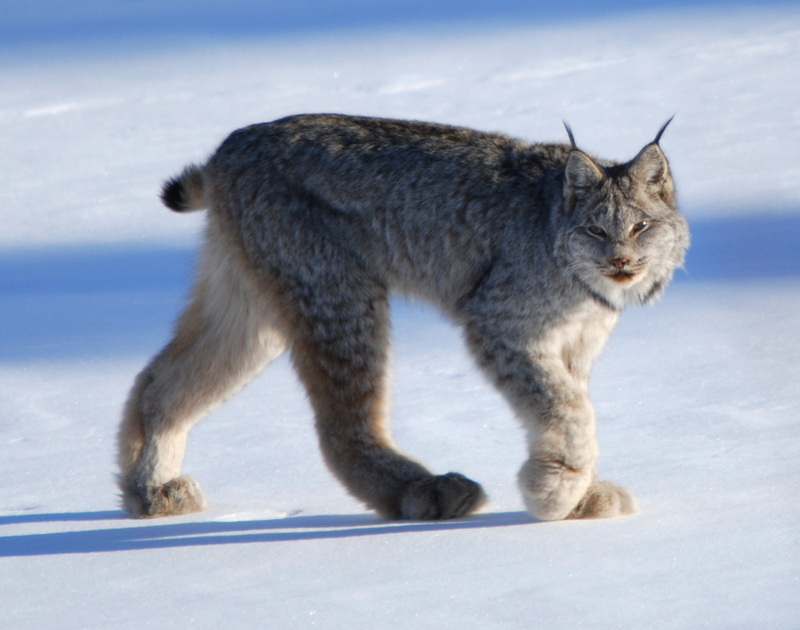 Fish and Wildlife Service, includes restrictions on conibear, body-crushing traps and snares, reporting requirements, monitoring, and a daily trap check requirement throughout lynx habitat. Last year the Fish and Wildlife Service proposed more than 26 million acres of critical habitat across six states for the Canadian lynx, which faces ongoing threats from habitat destruction and reduced snowpacks from climate change. Lynx are medium-sized, long-legged cats, ranging up to 24 pounds. They are generally nocturnal and well-adapted to hunting snowshoe hare at high elevations. If the Idaho Department of Fish and Game does not address the violations outlined in today’s notice of intent to sue, a federal lawsuit can be filed as soon as 60 days. The notice of intent to sue can be read here. Western Watersheds Project is a non-profit conservation group founded in 1993 with 1400 members whose mission is to protect and restore western watersheds and wildlife through education, public policy initiatives and litigation. Trapping is a barbaric and inhumane practice that needs to be outlawed. Oregon will have a ballot measure in 2015 to be voted on to prohibit trapping. Initial polls show a overwhelming yes vote. Does Idaho have a ballot measure system where the people can vote on statewide issues and if so is there any organization promoting the elimination of trapping in Idaho? Trapping also accounts for incidental killing of fisher which are rare and wolverine which is proposed for listing by the USFWS. I forsee IDFG writing a conservation plan that will allow incidental take and trapping will continue unabated. The only way to stop the killing of Lynx is prohibit trapping by a vote of the people. Hunting and trapping was protected as a constitutional right by ballot initiative in 2012 here in Idaho. Where in the Constitution is this behavior condoned??!! Seriously? I read and was very impressed with the letter of intent. I wonder if you will get a response from any of them. Thanks to all of you for your continued efforts. I found this information on google Ms. Berger. I appreciate the link. How very disheartening…that was so recent. It really seems the only way to change things in Idaho is for the feds to step in…which they seem so reluctant to do. That, unfortunately, is the indicative of the kultur of Idaho. Welcome back to the 19th century ! ALF does that stand for Animal Liberation Front? Yep really unbiased poster here.Why not add to the discussion with some substance? Like how to better habitat improvement for the Canadian Lynx etc instead of being callous and demeaning people you may not agree with. the amendments state that hunting and trapping shall be the PREFERRED method of managing wildlife. In Nebraska, Gov. Heineman recently vetoed LB 671, a bill that would ban hunting of the state’s small mountain lion population, estimated at about 22 individuals. He was afraid the bill would contradict Nebraska’s amendment that established hunting as “preferred means” of wildlife management. Do these amendments mean that any species that CAN be hunted or trapped MUST be hunted in states where hunting is the preferred method? What about songbirds? Should they be hunted because they COULD be managed as game? Wonderful news. I know the decision was made with much forethought as this chess move can backfire or blowout some shrapnel. I have here in the past voiced great concern over the incidental take of lynx, fisher, eagles and other nontarget species by trapping and have declared it is a violation of ESA. I have said it is ironic that an Idaho Conservation Officer will almost always ticket an elk hunter when he mistakenly kills a moose. I know, 10 years as a C.O, enforcement specialist and supervisory regional C.O. in Idaho. The truth be known, incidental take from trapping is very under reported. There is probably more SSS activity with respect to trapping than any other wildlife take activity. Concerning trapping the incentive is very strong with respect to the middle S and probably changes from Shovel to Sell most often. The agencies shouldering the management responsibility of lynx have looked the other way for decades which makes it that much more difficult to change. Old habits are hard to break. Wolf trapping is just as much a lethal trap to lynx as bobcat sets. The overall mindset in Idaho is so lacking in wildlife empathy and science based principles that I don’t ever see a citizen motivated movement in that direction. Be thankful for a strong federal court system and organizations led by good people like WWP and the others. I am proud to call Idaho my home state with regard to the geography and ecosytems but everything is managed with the powerful “HAVES” in mind not the “have not’s”, for that I am ashamed. If I moved back now probably would not feel like a good fit. Accolades to Ken Cole and all those in the various organizations making this important chess move. Larry I call BS.I know most of Idaho Fish and Game CO’s and no one has ever heard of you. RAY, YOU’RE THE BS. I CAME ON NOV 67 AT SHOSHONE AFTER PREVIOUS CO WAS KILLED IN A HORSE ACCIDENT. WENT TO BOISE DISTRICT IN 71; REGIONAL ENFORCEMENT SPECIALIST IN 73; TO JEROME IN 75 AS REGIONAL CO. RECEIVED EVERY PROMOTION I APPLIED FOR AND RECEIVED THE 2ND CO OF THE YEAR AWARD ISSUED BY THE DEPARTMENT. LEFT IN 76 AS SPECIAL AGENT USFWS AT PORTLAND. I DON’T EMBELLISH WHAT I SUBMIT HERE AND I DON’T APPRECIATE YOUR COMMENTS. YOU ARE OUT OF LINE. No need to yell about it. If you think back a little you’ll remember these kind of suspicious attacks are sometimes the norm around here. I’m sure that anyone who would remember you is long gone. topher, I don’t care if anyone remembers me, the BS part is what hit my hot button and should be offensive to anyone. Ralph has developed a wonderful science based wildlife blog. When someone thinks he has license to lie and attack personally he needs to be called on it. The only thing I regret is that Ray required me to go off message for a minute. Wow Larry real professional.Please tell us you don’t carry a weapon.I to am skeptical of what you say.You really carry on with your name and titles in a profession where it is generally frowned upon to publicly announce your disaaproval for laws CO’s are sworn to uphold and the voting public expects to be carried out.I have worked for Idaho Fish and Game for over 15 years and no one has ever heard of you and you certainly do not mirror the beliefs of most Idaho Fish and Game officers I’ve worked with.Maybe a footnote to Idaho wildlife history that has long since been forgotten.Maybe explains why you show up on this “slightly away from mainstream” website. Ray, you were blocked because you have never provided a comment that added to the conversation, your comments made unsupported accusations, and because your next comment was libelous. ..or maybe because you didn’t philosophically agree with him? Nancy thank you. I finally got to check/scan the link. Lots of information there. However, I remain disheartened. Great paper! While Idaho may have passed a constitutional amendment, there are two things to consider: first is it constitutional under the US constitution? Second, the Forest Service and BLM have the authority to prohibit such actions as trapping on public lands. They refuse to exercise that authority while allowing the rampant pillaging of wildlife by these trappers..
John the US constitution is not so much an issue as are Federal statutes that would conflict. In that case the federal statute predominates. But you are right that the BLM and other federal agencies often do have the authority to prevent certain activities under their jurisdiction and often don’t even when they are incompatible uses. Or their enforcement and interpretations are inconsistent as is evidenced in use of lands for killing contests. Thank you. All of these groups deserve donations. You guys keep working to protect wildlands and wild animals. Good work. I do wish trapping was outlawed throughout America. It needs to be left in the past. I am sorry but what a bunch of radical animal rights BS.For a web site that is suppossed to be not anti-hunting this thread is full of anti-trapping,anti-rural Idaho and anti-hunting vitriol.Signed 6th generation Idahoan with a Wildlife Biology degree.Anyone who buys into radical extremist groups like Centers for Biological Diversity of Western Watersheds seriously needs thier head examined.Educated at the University of Idaho what was then the College of Forestry,Wildlife and Range Sciences.Thank God for Idaho’sConstitutional right to hunt and fish. I think you will find a lot of people here are NOT anti-hunting or fishing, so you should not read these threads as threats to your right to do so. You may notice the focus is on trapping. It is unfortunate that your attitude is a perfect example of how polarized these issues are. Try to see that nobody is trying to take away your rights, but at the same time see that changes have to take place to allow for a more comprehensive view (ie yes, keep hunting but no, stop trapping). You really did not address the issue being discussed here. Your input could be important. It would be very big of you to show respect instead of contempt. Did you read the entire article? Did you read the entire letter of intent? You’re right Zoe – I am not against ‘pure’ hunting and fishing, just trying to turn it into an industry. I’m against the attitudes today, because we don’t need to hunt to survive, it’s been reduced to just the killing and ‘contest’ aspect only, and who can derive fun out of that. Those birds that Sally Jewell is intent on protecting up in Izembek? 31 birds per day can be taken per hunter. Trapping to me is too violent and too indiscriminate, and with our wildlife feeling increased pressure from all kinds of human activity and encroachment which will only continue, may not have a place in the future of wildlife preservation. Truth is I am really against any kind of killing of any kind of animal. However, I realize most people feel differently. It is important to hear from people like Ray. It is more important to find a way for mutual communication. As it is, the Idaho leaders all seem to be on one side, making any issue impossible to bring to any table. Were you able to listen to that last wolf management meeting? The only opposition was met with such disgust there was no room to navigate any dialogue in. It is fortunate there are people and groups trying to balance things out. Don Quixote comes to mind. Long live perseverance! Thank you all again. Where do you come up with this stuff? Elk hunters on average are successful one out every 6 years. Get some facts before railing against things. wolf moderate, I think where the heat is generated is that elk hunters think they should be successful 1 out of 1 years. Ah Larry as a supposedly wildife LEO did you not forget idaho’s traditional Elk harvest is usually only around 12%-15%? Unbelievable.Substantiate your claims instead of yelling at everyone. Don’t waste your breath. It’s impossible for some to see the facts for what they are. Hunters and fishermen should divorce themselves from the trapping industry. The commercial trappers got an undeserved free ride by including themselves with the hunters and fishermen on the Idaho constitutional protection passed last fall. Commercial trapping (Killing furbearers for money) should not have been included on the Idaho ballot for protection. I voted against it for that reason. As a life long Idaho hunter and fisherman, I find trapping to be very cold blooded. I would not want a trapper as a neighbor. I don’t feel that the trapping issue should have been on the same ballot as the hunting, fishing issue. I know several people in Idaho who are pro hunting and don’t like trapping. Ray, most people would say people like you are the extremists. Ray has contributed very little to previous conversations on this blog other than to make accusations and complain. Based on your writing and spelling you somehow managed to get your degree without taking any English classes. Couldn’t have said it better; I do as well. We seem to be headed in a strange direction today regarding preserving our natural resources and wild lands and their inhabitants – a self-centered only interest in the public lands for ‘recreation’ (hunting) and energy exploitation (there’s no scientific evidence that fracking is harmful, so let’s just go ahead anyway). Just how we can use them; not, as it was in prior decades, because of the value our wild lands have in and of themselves as well. Calling people who like to get outside and enjoy the parks in whatever capacity they enjoy ‘stakeholders’ makes it seem like it’s a money-making corporation, which wild lands and wildlife are not. It’s insulting. Can’t we see or value anything else in our world that is not in terms of money? It’s not a reliable means for this anyway. I hold out hope for change in 2016? And that in the next couple of years not too much damage will be done, and any damage can be reversed. Some of the comments I read when those boy scout leaders toppled 170 million year old rock formations in a Utah state Park said, ‘So what? It’s only rocks’. Ray, to say people need their “heads examined” for belonging to one of the mentioned groups just shows how ignorant you are. Yes some people on this thread probably are anti-hunting/trapping…surprise surprise and there is nothing wrong with that. You have your opinion so does that mean you need your head examined…If you look at history before these “radical animal rights” groups, certain hunters and trappers wiped out species across the nation. There was no balance…I think most on this thread are for subsistence hunting and against recreational hunting and trapping. Killing for recreation is wrong! You nailed it, Mike. At least, that is my view. I’m okay with hunting for meat and am not going to try and stop people. I am not okay with recreational killing. I am okay with trapping for science. I am not okay with with trapping for fur. It is torturous, inhumane, and unethical. That is not an opinion; it is a fact. If you don’t believe so, then see how you would fair with your leg, your arm, your body in one of the many different kinds of traps. Now be caught in that trap for days on end and when the tapper does check his trap see how you would fair when they turn their dogs on you. That is not justified by any means. And why do we keep hearing the “I’m X generation” as if to imply that trumps someone who is not. If that is the childish mindset we’re to adhere to then I think the Nez Perce trump everyone else in Idaho. Just because there are not many Canada Lynx in Idaho does not make them an endangered species. In Idaho, there is not much Canada Lynx habitat. To the misled people who think a lynx lives in a desert, you are wrong. It seems that you are the one who is misled, Idaho is not all desert and much of Idaho is considered lynx habitat, especially northern Idaho, but much of central Idaho as well. And, yes, the fact there are few lynx is what makes them “threatened” under the Endangered Species Act. I would say that everything north of the snake river plain, and many areas south of the snake river plain that are not totally agriculture usage would be suitable lynx habitat although they are probably only to the north, MrRight(only in your own mind). There’s something not quite right in a trapper’s mind. The few that do come around do so after killing thousands of animals. That’s how long it takes them to feel empathy. Not someone I’d want as a neighbor, either. Lost or ignored in this discussion, and apparently the lawsuit, is the impact snowmobiles have on lynx and wolverines and their habitat and prey species. Mike, fear not, the American judicial system will require proof in this lawsuit as is done in every lawsuit. The ESA is not “cover” for any agenda except a more healthy ecosystem for the earth of which you and I both benefit equally. The ESA is abundantly clear with regard to its wording. If agencies would simply follow the provisions provided in the Act court challenges would be nonexistent. That is simply untrue. Most who post to this forum/blog are pro-use–myself included. However, some of us take a different view of wildlife ‘uses’. From my perspective, viewing wildlife (including photography) is a USE that impacts wildlife(not nearly to the extent that hunting or trapping impacts wildlife, but it is a use nonetheless). I see wildlife ‘uses’ on a continuum from those that have direct impacts on individual animals and/or populations (i.e., hunting, trapping) to those that have direct impacts on habitat (i.e., grazing/burning/timber harvest), to those that have indirect impacts on habitat or wildlife behavior (i.e., viewing, or photography). From my perspective, there is no ‘anti-use’ philosophy; there are only philosophies that put one use ahead of other uses. CBD’s perspective clearly emphasizes ‘non-consumptive’ uses of wildlife, while others emphasize ‘consumptive’ uses. Both sides use the courts to their advantage; to call one out and ignore the other is really only an admonition of one’s own biases. One of the quite possible outcomes that might be handed down in this suit is incidental take (I.T.) ruling. We have mentioned it several places but I would like to see a discussion re how do you think a judge would provide? Without regard to the number a judge may allot to I.T. how would the number be policed/audited? As I see it now there is more incentive to self-report than ever would be after such a ruling. Now a trapper self-reports and elevates himself in the eye of the public. After a ruling that trapping may continue until the I.T. number is reached, I cannot find ANY incentive for self-reporting. Every report would inch along to an early season closing, animosity among trappers to the self-reporter and the I.T. provision would simply grow contempt from trappers toward the ruling. There is just every incentive to not report and none that encourages reporting. I know this reference is from long ago but I believe still holds true: Vilkitis, working under R.H. Giles Jr. (Univ. Idaho circa 1966) did post grad work on poaching and found if I remember, only 10% or less of poaching incidents come to the attention of wildlife LE. Memory is a little fuzzy but I think I am pretty close. However you slice it even the most trusting person has to agree that the Boy Scout honor system won’t cut it. To butress your point of poaching in in incidents coming to the attention of wildlife officials. In MN, after conversation with two different MN DNR officers, on two seperate occasions, they confirmed that on average 10% of MN wolves are illegally killed. That is somewhere between 200-300 wolves per year. I believe 5 or 6 individuals in MN last year were brought up on poaching charges. So, how does an agency administer an incidental take court order on trappers often alone in the woods when they have no incentive to “testify” against themselves/the trapping industry? I’ve thought it through and through and can only conclude trapping using any indiscriminate implement capable of taking a lynx in lynx habitat must be prohibited. Any out of court settlement may put pressure on land management agencies (USFS) to support take activities such as trapping by managing more habitat for lynx. Who knows the roads this lawsuit may take. I just hope it doesn’t go down a dead end. Simply trying to reinforce your point. Many times in the past on this forum we have discussed what you have brought up. If I shoot something out of season, it’s poaching. However if I trap a non- targeted, perhaps protected or out of season animal(incidental take) there are no repercussions, and you are correct; there is no real incentive to report such take (though it is done). Immer, it would be helpful to have a statistically viable study to learn the hours of trap line set time and the resulting composition of the take. A lot of variables in a study like that not to mention a lot of pain and suffering inflicted on the unwitting samples. My money says self reporting of lynx trapped under incidental take would be on par with self reporting deer poaching. I wonder if such research could be done nonlethally using bait and camera as random species searches are done now. It would be quite expensive I am sure just buying the equipment. The bait area would need to replicate trap sets as is normally done. And then a camera for each plus the people to retrieve data on what sure would be many miles of sets. Oh and don’t forget the time element. I’m too old to try and figure this out but fun to play with it. I’m back to saying incidental take is nonenforceable. The simplest thing would be to ban trapping, snaring and body gripping devices. At the very least the agencies should restrict how many traps each trapper sets. Otherwise how can they understand the impact of the traps whether by incidental catch, unreported or reported. And some species can be hunted without license. Restricting trap numbers would give an idea of how many are set by license but there are not many restrictions I know of. When you think about it, it is horrifying to think that in many places people can set as many traps, snares or body gripping devices as they can afford. Here is a thread from 2/13 about incidental take, reporting of such, and mortality. At least these ‘were reported’. Does not answer your question of how many not reported, or hours of trap line set time. There is a lot of meat to chew on in that article. Just the fact that 41 trappers took 99 nontargets is alarming enough. I remember reading this when it was posted but didn’t digest it then. I have to say if I were an SA in Idaho now I would drive an AUSA nuts trying to have these threatened spp take prosecuted. Trapping was not at all this prevalent during my time. The only denial of prosecution would have to be prosecutorial discretion based on politics. The elements of the crime are clearly there. As soon as trappers realize they are testifying against themselves with self reporting all of this information will vanish. I attempted many times to monitor trap lines in my career and know it is practically impossible without snow. Maybe a trained dog on a short leash but my point is that enforcement of trapping regs are tough and trappers know that. Immer I understand your position on trapping. I see it as to ally out of control. The man you met this summer is not an “isolated incident” as some like to believe. all you need to do is type in coyote into a web browser and in seconds will come up with terrifying images of dead coyotes shot in hunting contests, or stuck in traps, and the worst are the weekend warrior trappers that kill for pelts or take the animals across state lines to be sold in penning facilities. Traps are the scourge of the earth. How does one kill 50 animals and not skip a beat. Coyotes have such expressive, intelligent, dog like faces. No heart, compassion or empathy. The people that post about trapping coyotes often pose with the terrified animals. I saw one SOB posing with a beautiful black coyote (I had never seen a black one) and he put sunglasses on it and boasted about what a long day the animal was in for. I felt such rage. meant to say under reported in my last post instead or reported! Conibear traps are just horrible killing machines- your dog won’t stand a chance. One more Wolverine down of the estimated 300 that still persist in the western US. Scott, two or three years before this one and same general part of the state a wolverine was trapped in a leg hold trap. The department took it to a vet where the leg was amputated. The news article said it was released back in the wild and to the effect, “healthy and well”. Go figure? Before I begin this thread I apologize for taking up so much space but this topic is part of my heart and have beaten this drum my entire career so please be tolerant. This entire notion of threatened spp take falling under the ESA is well and good, but… Idaho’s (as well as all states) wildlife laws and regulations are strict liability laws. Intent is not necessary to prove in prosecution and if it was the setting of the trap is intent. What we have then is, forget the ESA for a moment, ANY incidental take of an animal in Idaho for which the season/method of take/or license required, is contrary to law, is a violation. If you just take the summary report compiled by the department that alone should outrage citizens of Idaho as to the “authorization” the department is giving to trappers to poach the state’s wildlife. This pass given to one class of people is not supported by statute. If hunters were allowed a pass to shoot at every creature that moved in case it was what they were hunting for everyone would revolt. What if the number of trappers triples or even increases 10 fold. If 41 trappers take 99 nontargets that’s 2.4 per trapper without factoring in set times. Without other limiting information 2.4 per trapper remains constant as the number of trappers increase. Point- it is time for simultaneous state citizen challenges to protect their wildlife from unlawful take and the department being complicit. The department is arbitrary and capricious. @Larry, ++++ 🙂 I wish we had a ‘like’ button. ahh well, this works. Very elusive and amazing creature.Actually rare to see one. Larry – very logical argument. This IDF&G video show how to free your dog from a trap, but is preceded by a short video of trappers hiking through snow in the 19th century. Our southern states had a “heritage” of enslaving fellow human beings for over 200 years – didn’t make it right! Spot on comparison! I hope some of the attorneys out there will jump in. I tend to get tunnel vision on this subject and am sure I am guilty of overlooking some real pitfalls. All of my ideas need refining by another viewpoint. Hopefully not deflated though. The Conibear is the only real advancement in trap design and we know that advancement was to save ammunition, trapper doesn’t have to put a bullet in the head. “Despite all the caution used…”. What caution? Do they now put up signs that say, “Lynx-Keep back-Gotcha in the Area”? Addendum: Trapping is essentially unchanged from when slavery was operational in the southern states. Only changes amount to trappers no longer spend 1-2 years living in the woods and getting drunk for a month at a rendezvous. Although the latter may have some room for debate. Come on Steve, I’m old enough to understand your ideas. Spell them out. Line out where I’m wrong, maybe some of your thoughts will be wrong and some of mine, but what if your good thoughts and one of mine actually has legs. Then Larry promote soft and non-lethal trapping instead of being a hot head and knocking Idaho’s Constitutional right to hunt,fish and trap? Upon reading that there has been an incease in the number of incidentally caught lynx, I have to reason that it is because of one of two possiblities. Either the number of trappers is increasing or the number of lynx is increasing. The number of trappers in Idaho is currently lower than the 1980’s and slightly higher than the 1990’s. In fact since 2006 the number of trappers in Idaho has only varied by a couple dozen going up and down from about 1000. If the number of trappers has not increased then my thought is that the lynx popoulation is increasing. The number of incidentally caught lynx could be a good indication of an increasing population trend, good news. This of course would need to be confirmed by more specific studies. Such studies are occuring in North Idaho with regards to Wolverines, lynx and fischers. Hopefully the studies being conducted will soon begin to return estimates of total population and trends. I do not oppose trapping, however, in areas where incidental catch is happening it would make sense to only allow the non-lethal foothold traps as opposed to the connibear style traps. This would give any incidentally caught lynx, wolverine or other non-target species the best chance of being released. What part of the ESA did you find “best chance of being released”? Cat prices spiked in recent years so that may be the reason more sets are out and more lynx and fisher are dying. The idea of a trapper self reporting is a joke. That’s like asking a bank robber to self report. Make it mandatory and fund enforcement so they can set up cameras to record incidental catches and if they are reported or tossed in the brush. Then charge the illegal trapper in federal court and a lifetime ban on trapping in ID and any other state that has a reciprocle(sp) agreement. That raises the stakes and will cause trappers to think twice about not reporting. One solution would be to replace locking snares with cable restraints and require a daily check on all traps and snares. To protect the deer and elk put breakaways on the snares. Bobcats can readily be taken with cage traps and that allows the safe release of incidentals and even female bobcat if the trapper wants to practice sustainable harvest. Whatever you do, don’t follow MN’s lead. The restrictions that came about from their lynx lawsuit are largely a joke. One “restriction” if you want to call it that is that body grips have to be a minimum of 36″ above the ground or snow. Another “restriction” is that snare loops must be 8″ to 10″ in diameter. They must have found a very gullible judge to buy that load of bull manure.